I often need to mark a mail as unread after having read it. I do this (in message view) by pressing menu and then "Mark as unread". Personally, I'd prefer to have an icon in the bottom navigation to mark as unread (for example instead of the navigation arrows as I slide to switch message). Go to App Settings, Message view. You can "Customize the buttons" in the message view. Even with last build, can't find mark unread option ?! Click on "Customize the buttons", then select buttons you wish. If, after checking - and rechecking - you still have an issue, please post screenshots to be able to help you. I suppose that your option list is truncated due to your screen size. 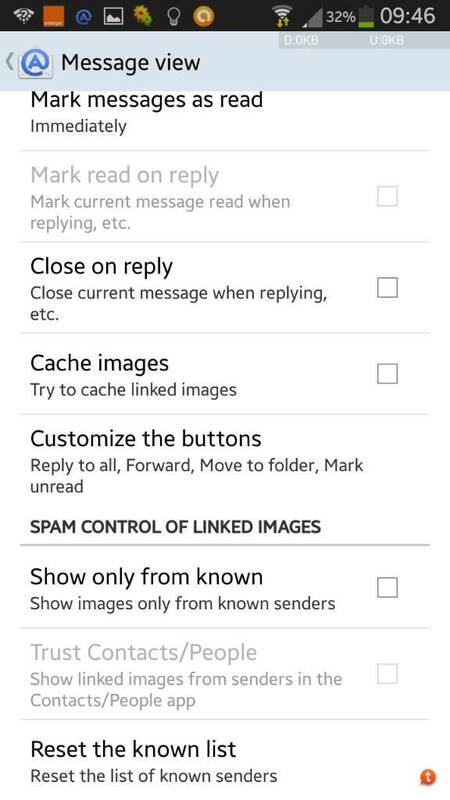 With your finger, drag the list, you should see "Mark unread"
PS. Unable to reproduce your screen. Tested with several devices, Android 4.0, 4.3, 4.4, all show "Mark unread"
I already tried that. Even in landscape mode, i can scroll but still no mark unread option :-( thanks anyway ! Maybe it's because you upgraded with all development builds ? The last one may be faulty on this point... I've an old Android device, i can try 1st with last build, an then install all development builds following official release ?